Different lithium battery manufacturers use the term BMS to mean different things. It’s important to know what you’re getting because the battery management system is used to keep the system running smoothly and protect the battery from permanent damage. Some BMS systems might just be an idiot switch that disconnects the battery if it sees an internal voltage outside some predefined range (say, 10v and 16v). Their range of operation is designed to prevent catastrophes, not to condition the pack or encourage longevity. Others include cell-level monitoring and some degree of balancing in addition to having the overall protection. Our lithium pack BMS does that. It looks like the one that the electric car parts company sells is very similar if not the same one. Obviously, if you buy a sealed “drop-in” lithium battery you normally can’t get to the individual cell terminals to measure voltage and see whether they’re in sync. You have to trust the BMS. You have to trust that when the manufacturer says BMS they mean a true BMS rather than just an under/over voltage cut-off. Our BMS communicates using little flashing LEDs on each cell and on the main board. We can tell the status of each cell in the battery. We don’t need that on a daily basis, but it’s good to check on your battery’s health every now and again. Other BMS systems don’t allow that level of granularity. That might be OK for you, but the lack of information shown on the outside of the battery probably means it’s not being monitored on the inside either. Without cell-level monitoring, your battery can get out of balance. That can damage it. Batteries are made up of a stack of cells. In lithium batteries, four cells are wired in series to create the correct voltage range for a (nominal) 12v system. As the cells charge, small differences in how they are manufactured mean they might absorb current at slightly different rates. This drift happens over a long period of time, but it can end up causing issues. If one cell gets seriously out of whack from the rest of the cells, it might get overcharged (and damaged) before the rest of the pack reaches full charge. A battery-level sensor won’t pick this up because the overall voltage isn’t too high, but the voltage of one cell could be much higher than it should be. A good BMS will detect each cell’s individual level of charge and start shunting power past a cell that is ahead of the rest. In practice, we’ve found that the conditions for balancing to take place are within a pretty tight tolerance, and it’s been hard for us to “force” the BMS to balance. Basically, for our BMS (and probably others too) the voltage has to be in a set range, just over the recommended bulk charge voltage but not so much higher that it causes a fault. That’s between 14.2 and 14.4v for us (other lithium battery chemistries may differ). Even in that narrow range, the bypass circuitry on each cell can only handle a pretty minor amount of current, so the balancing must occur over a long period of time. If you are trying to use raw alternator power as your charging source, you’ll probably never get the benefits of cell-level balancing. The voltage isn’t controlled enough to create the right conditions for balancing to occur. The engine isn’t on for long enough for balancing to finish. A good BMS will still protect a cell that’s seriously overcharged, but it’ll be harder for the system to keep things well maintained. In that situation, you’d have to top balance on a bench with a highly controllable power source or by disconnecting the charged cells and reconfiguring them in parallel to equalize over several days. With a drop-in replacement battery, that’s not an option because the cells are all hidden away inside a sealed container. Our BMS also has relays that can trigger other events based on cell or pack level faults. It has a low voltage relay that can (for instance) be used to start a generator. It has a high voltage relay that can (for instance) shut off the charging source. As you can imagine, there are many possibilities with this type of level of control. You may come away from reading this feeling depressed about the amount of care and attention that a lithium pack seems to require even with the magic BMS. I’d argue it’s no different from what people should be doing with their lead-acid batteries. Wet lead batteries need frequent electrolyte checks. Most lead batteries need desulphation cycles too. There’s a higher requirement to keep the batteries in a full state of charge. It’s still possible to over-charge the batteries and hurt them. In other words, they still need maintenance if you want them to work to their full potential and last a long time. If you decide that you’d rather have a lithium battery than a lead-acid one, then I’d suggest you carefully research the battery management system that comes with it. The drop-in replacement batteries you can buy seem appealing because they are sold as sealed, “maintenance free” units. However, without a BMS that allows cell-level monitoring, balancing, and status reporting the fact that they are maintenance free actually counts against them. If you can’t maintain them, they aren’t going to last as long as they could. Even if you don’t use all the features that a BMS has, like high and low voltage relays, it’s good to check that the BMS on the lithium battery you are considering buying has at least cell-level monitoring and preferably cell balancing as well. If not, all you really have is a failsafe switch, not a true battery management system. HI Dieselfumes, I am going with a li-ion setup and the supplier also sold me some contactors (NO and NC) I didnot see you mention those apart from the Balancers. Did you use any contactors? If you did, could you shed some light? Thanks for this wonderful resource you have created. The contactors are probably part of your battery management system. We have one main contactor that is the first thing in line after the positive terminal from the battery. If the battery management system thinks the battery charge is too low, it will open the contactor. That turns off power to everything else. A smarter battery management system uses two contactors – one is for charging, and one is for discharging. The BMS lets the charging contactor stay closed until the battery is fully charged, then it opens it. You’d probably use a Normally Closed (NC) contactor for this, because it’s usually fine to charge, and you only want to apply power to the contactor to open it when the battery is fully charged. The BMS keeps the discharge contactor closed until the battery is depleted, and then opens it. You’d probably use a Normally Open contactor for this. It doesn’t use a lot of power to keep the contactor closed, and it means that if the battery runs low, its default state is to open the contactor. Of course, your BMS instructions will tell you which contactor to use for which circuit. The problem with this approach is if you have an inverter/charger. This device uses the same positive cable to pull power from the battery and also push it back to the battery. So you can’t use two separate contactors for a charging circuit and a discharging circuit. A third way that BMS systems manage this type of charge/discharge control is by sending OK-to-charge and OK-to-discharge signals to your inverter and charging sources. These use relays rather than heavy-duty contactors, but they work in the same way. Of course, your inverter and charging sources have to have a way of “listening” for the OK-to-charge/discharge signals. Our BMS and Victron inverter and solar charger can be set up this way, I just haven’t got round to it yet. First off, complements to your blog, this is the best documented build I have ever seen and has been incredible useful as we embark on our own build. Regarding having your BMS talk to the victron inverter and solar charger: I’ve been searching through the victron documentation for how to send a simple bi-stable charge enable/disable signal from a BMS and can’t find how to do it with the multiplus. Can you point to anything that shows how to? Nate, I’ll take your complementary compliments! The Multiplus has two sets of terminals that can be re-purposed as OK-to-charge and OK-to-discharge relays. The temperature terminals and multi-function relay can be re-mapped using Victron’s VE-Configure software. There’s a white paper on the Victron site that explains this in some more detail. These are potential-free contacts so you’ll need an optical isolated relay or similar to make everything work properly. The VE-Configure software is clunky but it works OK. We wrote about how to update the inverter a while back. Perfect! That’s exactly what I was looking for. Thanks. 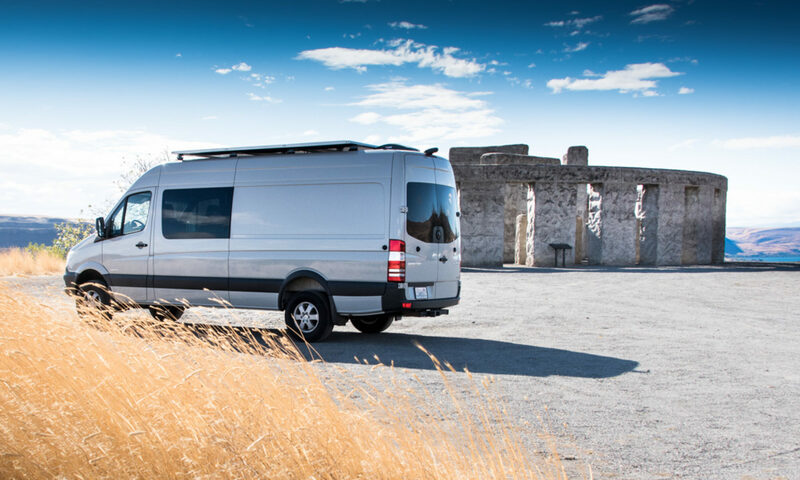 Hey Zak, most of what you need to know about our battery is in this post – https://sprintervanusa.com/2015/09/22/the-battery-is-the-heart-of-the-van/ BUT that company is out of business now. We’ve been happy with all the Victron gear we’ve used. Their batteries are more expensive than comparable ones from other manufacturers, but I doubt you’d ever have trouble with them. Thanks, not sure how I missed the page. I’ve been looking at Battle Born Batteries and Vicrtron batteries as options. The BB batts seem a little cheaper but still solid and with the added benefit of smaller cell blocks so easier replacement if/when needed. I think I remember you have a heating pad for your water tank. Did you do anything like that for your batteries? I have read that charging the Lithium batteries when they are below 32* F is bad for them. Brian, we’ve considered adding a heating pad under the batteries. It would keep the batteries warm and also the energy used to heat the pad would make the batteries warm up, so a double advantage. The other alternative is to wire a thermostat to the charge/don’t charge relay on our battery management system. That would mean the battery doesn’t try to charge when the temperature is below freezing. The thing is, if we’re living in the van, the batteries aren’t going to drop below freezing because we keep the van warmer than that. If we’re not living in the van, we can turn off the charging sources or we can plug in to shore power and run a small electric heater in the van. For the few times when we might accidentally have the batteries charge in freezing temperatures, our particular batteries are Yttrium doped (Winston brand) which theoretically extends their temperature range below freezing and reduces the risk of creating lithium dendrites on the electrodes. Previous PostPrevious Will I blow up my battery if I plug in multiple charging sources?